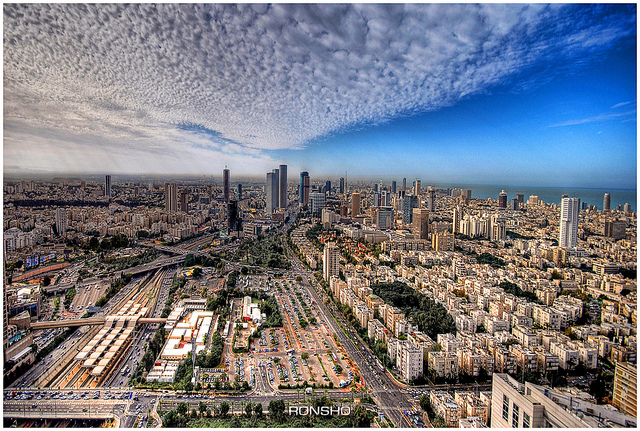 Tel Aviv skyline. Photo credit: Ron Shoshani, via Flickr Commons. November 15, 2012: “I was sure that it was a new song by Shlomi Shabat, but it turned out to be a siren,” tweeted Israeli rock star Aviv Geffen. At first glance, this tweet was part of an ongoing, good-natured banter between Geffen and fellow musician and reality TV judge, Shlomi Shabat. This particular jibe was neatly placed, comparing the rising and falling wail of the siren used in Israel to warn of an incoming rocket attack to the soaring sounds of Shabat’s voice, whose high, nasal production and melismatic slides serve as a markers of the genre of muzikah mizraḥit (eastern music), contrasting with Geffen’s rough rock tones. One siren at 6:38 PM was enough to paralyze the most important oxygen line of Tel Aviv: the cellular phone networks. Calls did not connect . . . The tables in popular Café Landwer in the middle of the boulevard emptied fast. Half of the clientele ran for shelter shouting “Imaleh!” [Mama!] and the other half filmed on their cellphones. Very quickly the guessing game began: “where did the rocket fall?” Tel Aviv is spread over 54 square kilometers, but miraculously—everyone heard the boom. From the south, from the north, from the sea. Someone on Rothschild quickly updated that the rocket fell “at Herzl-Yigal Alon”; only after long minutes did the correction come that there is no such street. After that it was said that the rocket fell on the Tayelet, and then among the sands of Bat Yam, in the south, in the southeast. Light hearted as it might be, the Haaretz report captures the centrality of sound to the experience of civilians in Israel during the recent rounds of military conflict with Hamas militants in Gaza (November 2012, summer 2014). Sounds not only warned of an imminent threat; they became a defining experience of “being there” during the conflict and a source of up-to-date information, giving auditory confirmation that a rocket had indeed exploded and allowing civilians to judge (or at least to speculate on) locations of rocket impacts, which were generally not reported in the press. While the sirens themselves lasted only a few minutes at a time, their existence in the wartime soundscape prompted new regimes of auditory attentiveness. Friends and colleagues reported changed practices of everyday listening (“I listen to podcasts with one earphone only in case there is a siren”) and a growing intimacy with the sounds peculiar to this upsurge of conflict (“the siren sort of coughs before it begins”). Israeli national media joined the network of sonic warning: popular songs on the radio were frequently punctuated by a newscaster’s voice reading alerts of sirens in different parts of the country. While not predictable by time or place, the sirens produced a kind of rhythm to the war, both on a short timescale, as civilians waited for the “boom” a predictable number of seconds after the siren sounded, and marking waves of tension and catharsis on a larger scale. The presence or absence of sirens enabled civilians to speculate on diplomatic matters, judging the success or failure of ceasefire efforts. The sirens did not only demand active listening—they also disciplined the body, calling for immediate action. Primed to listen for rising and falling sounds, increased auditory sensibilities led many Israelis to experience “false alarms” upon hearing ambulance sirens or passing motorcycles: during the summer of 2014 Israel’s Magen David Adom changed the siren of ambulances to an alternating high-low pattern to avoid confusion. Discursive echoes of sirens filled conversations (“did you hear that?” “what were you doing when . . .?”) and public discourse. These sounds took the place of others that were less easy to talk about, if equally part of the daily soundscape during these periods of heightened conflict: the loud engines of warplanes flying south, the dull thuds of shots being fired during police clashes with Palestinian protestors in East Jerusalem, and the eerie silence of late-night military funerals. In turn, the wartime soundscape also exacerbated other sonic tensions in society. Far-right Jewish youth dressed in t-shirts of the Lehava organization patrolled the streets of central Jerusalem for some weeks, listening out for Arab accents; some Palestinians in East Jerusalem celebrated Hamas rocket fire with loud fireworks. Meanwhile, during the summer of 2014 Israeli and IDF spokespeople used the sound of the siren as a central part of hasbarah (propaganda) speeches and video clips seeking to persuade the international community of the legitimacy of Israel’s offensive operation. “A history of modern nation-states,” writes Brian Massumi, “could be written following the regular ebb and flow of fear rippling their surface, punctuated by outbreaks of outright hysteria.” Recent research on the soundscapes of violent conflict has generally focused on the intense experiences of the front lines of battle, whether of civilians seeking shelter or fighters playing heavy metal music to pump themselves up before a mission, or on symbolic uses of music outside the immediate conflict zone. Yet the auditory experiences of civilians in the hinterlands of active conflict help equally to shed light on the lived dynamics of modern asymmetric warfare. While the experiences of most civilians living in Israel’s central regions during the 2012 and 2014 military operations were very far from the physical destruction that civilians in Gaza experienced at that time, the soundscape of the war touches on the ripples of fear that armed conflict causes in the stable surface of the state. The frequent sounds of the sirens reinscribed the politics of public spaces at the center of Israel’s civic life, at once articulating both the state’s efforts to protect its civilians from harm, and its failure, in the form of an incoming missile, to ensure security. These sounds fused public and private spaces: the sounds of the sirens and the explosions of missiles penetrated individual homes in a way that mirrored the penetration of national space by the missiles themselves. The sounds of sirens and explosive booms—and the dark humor generated in their wake during the weeks of the conflict—came to an abrupt halt as ceasefires were reached in both periods of conflict, and for most residents of Israel, life returned to normal. Yet their echoes remained in the bodily habitus of Israeli civilians who still found themselves starting at the sound of ambulance sirens, an embodied reminder of the ability of the soundworld of military conflict to seep into, and to color, everyday auditory experiences.